When Brad married Sara, he was hopeful that he would become a dad to Sara’s two children, Megan and Dylan. Although Megan and Dylan were initially opposed to Brad, they have started to accept him. Just as Brad is starting to feel confident in his role, the family receives a call from Dusty, the children’s father. He is coming back to town. The kids are excited, Brad is hopeful, and Sara is anxious. Dusty quickly makes it clear that he has come back to reclaim his family. Brad’s long-held desire to be a parent, and some may cringe at the harsh treatment of Brad’s infertility. Others (perhaps especially those who’ve adopted from foster care) will recognize the struggle of identity between Brad and Dusty. The kids obviously love both Brad and Dusty, and Sara is able to articulate that the kids have two dads. This is kind of a spoiler alert – Brad and Dusty do learn to work together and act as co-parents. Brad is a dedicated dad to Megan and Dylan, and encourages Dusty to be dedicated to them as well. This film could be hard for viewers with unresolved grief around infertility. Megan initially expresses her displeasure at having Brad in her life by drawing a series of pictures of him dying – and at least one in which Megan is killing him. This doesn’t seem to concern anyone. Dusty is very disrespectful towards Brad, and undermines Brad around Megan and Dylan. Brad expresses, “I’m not their real dad.” The word choice is unfortunate. 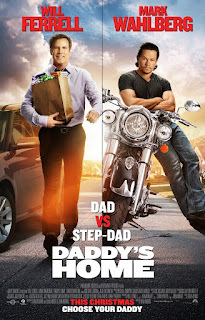 Daddy’s Home isn’t a good choice for kids, but it could be interesting for adoptive parents. As you watch it, explore your thoughts about birth parents – what are they like? How can you interact with them? How can they be involved in the life of the children? Notice which parts of the film seem realistic and which seem overly fanciful. What’s the difference between a father and a dad? What makes someone a “real” dad? How many people can be “dad” to the same kid?